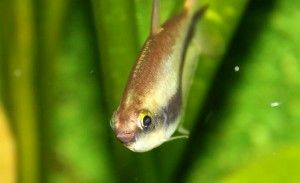 HomeAll Posts...Tetra Species | 5 of Our Favorite Tetra Fish! Tetra Species | 5 of Our Favorite Tetra Fish! 5 of our Favorite Tetra Fish! There is little doubt that pretty much every fishkeeper knows of and has probably kept them: tetras. These schooling fish are appreciated by aquarists for their decorative value (colors!) and often easy care. Probably the most commonly kept tetra is the neon tetra, but did you know there’s more? Today we’re sharing five of our favorite tetra species that might not be the first ones that come to mind when you go to choose your fish! We’re kicking off the list with the pretty Buenos Aires tetra, which is named after its suspected natural occurrence in Argentina. Reasonably sized at a maximum of around 2.4”, this colorful species makes a great choice for your aquarium of 30 gallons (long) and up. It’s hardy and not too difficult to keep, with a very variable temperature and pH tolerance. The Buenos Aires tetra does well in many types of communities, but do keep in mind that it’s rather active and can even turn to fin-nipping if it’s not kept in groups of at least about 8 fish. The best tankmates are ones that don’t mind their high activity level and can stand their ground where needed, like Corydoras catfish. If you’re in search of a good addition to your South American blackwater biotope aquarium, stop right here. 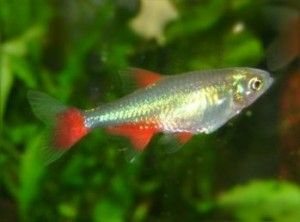 Hemigrammus rhodostomus, also known as the rummy nose tetra, is naturally found in dark waters in the Amazon basin and will love a similar environment in the aquarium. Keep the red-faced rummy nose tetra in an aquarium of at least 20 gallons (long) in a group of at least around 8 specimens. Tankmates should be calm and not bothersome to these peaceful tetras. Other small schooling fish as well as dwarf cichlids that hail from similar water, like Apistogramma agassizi (caresheet here), make a good choice. Did you know? There is more than one tetra species commonly referred to as the rummy nose tetra. Hemigrammus rhodostomus and Hemigrammus bleheri are easily confused, but luckily their care requirements are the same. 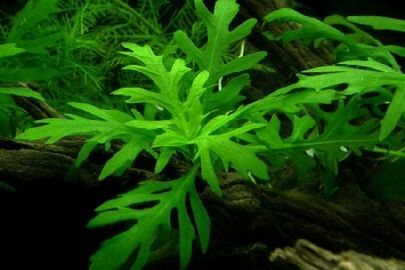 Another delightful little tetra that we love to use in our aquariums is Aphyocharax anisitsi. 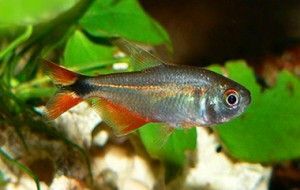 Not to be confused with the similarly named Hyphessobrycon anisitsi (Buenos Aires tetra), the bloodfin tetra stays smaller and can easily be recognized from its silver body and red finnage. If you’re setting up an aquarium for bloodfin tetras, make sure it’s at least 15 gallons (long) and contains plenty of plants for cover. 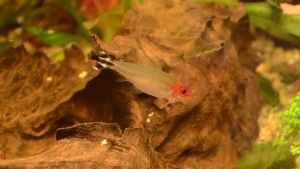 At least 8 tetras will work best; complete the tank with small South American catfish species or maybe one or more of the other fish on this list. Water values aren’t too much of an issue as long as the tank is kept clean, not is temperature. Even room temperature aquariums without a heater should work! The impressive bleeding heart tetra (Hyphessobrycon erythostigma) was named for the striking red dot on the side of its rosy-silver body. Naturally found in slow-moving, acidic waters, this species makes a great choice for peaceful Amazon-style community aquariums. 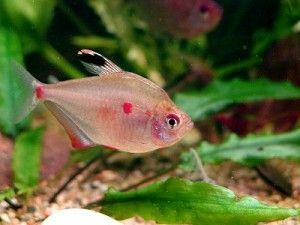 Because the bleeding heart tetra can reach a size of up to 2.4” and should be kept in groups of 8 or more, it’s a good idea to go for an aquarium of 30 gallons (long) or up. This gives these active fish plenty of space to move around and show their natural territorial displays. Probably the absolute most spectacular species on this list is the appropriately named emperor tetra (Nematobrycon palmeri). 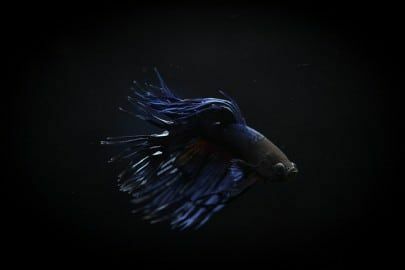 Its coloration (rosy-silved body, yellow-black finnage, jet black horizontal stripe and bright blue eyes), and the males’ impressive finnage make it a beautiful addition to your South American set-up. Luckily the emperor tetra is not just spectacular, but also quite easy to keep and suitable for beginning aquarists. 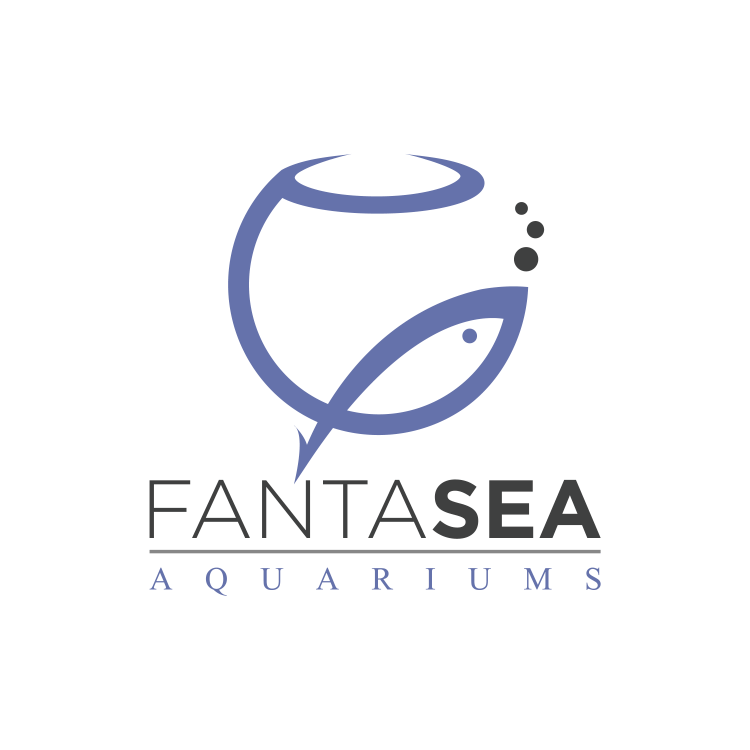 It withstands a wide range of water conditions as long as the aquarium is fully cycled and clean, and will play nice with pretty much any equally peaceful tankmate you can think of. Because this species doesn’t grow too large, an aquarium of 15 gallons (long) or up will be enough to sustain a shoal. Looking to set up your own aquarium but lack the time or knowledge to get things right? Our job is to get our hands wet so you don’t have to.  FantaSEA Aquariums can set up and maintain your tank so all you have to do is enjoy it.  All you have to do to get started with planning your new tank is contact us here with your ideas!